It was kind of expected that the Grand Slam Standard would turn out to be as wonderful as Latin was the day before. There were clear favorites to reach the final and the crowd was making sure we all knew who they were. There were three Russian couples, two Lithuanian couples and a German couple who found their way to the final. The Russian crowd of course welcomed the three-time World Champions Dmitry Zharkov and Olga Kulikova and their fellow Russian contenders Evgeny Moshenin – Dana Spitsyna and Alexey Glukhov – Anastasia Glazunova with loud support but they also paid the other three couples the respect they had earned during quarterfinal and semifinal. It was nice to see the warmth of the crowd, which obviously enjoyed the evening with highest quality of Standard dancing. Coincidence or not, it was a special moment to hear “All By Myself” played for Dmitry and Olga for their solo waltz in final, as just a little more than an hour before we had an in-depth interview with Dmitry only. 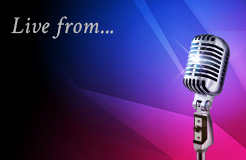 You will have a chance to see the interview later. Of course we understand, preparing for the final stages of the competition takes time and effort and we wouldn’t want to interrupt her adjusting her dress and making finishing touches to her appearance for the spotlight in order to be perfect. Dmitry, however, showed into the interview room relaxed and seemingly enjoying the atmosphere of the event. And they were perfect. Dmitry and Olga dominated the final from the beginning to the end. And for the other finalists, there were no changes in positions after waltz. It seemed like a clear case, but for sure there were highs and lows for all couples somewhere in between. Mostly highs, as we can see from the increasing number of points compared to their semifinal points. For their emotional Dance of Honor they chose Waltz, and the same song was played again. Tears were rolling, not only on Dmitry’s and Olga’s faces, but also outside the parquet. It was a beautiful and a perfect end for the Sunday evening. 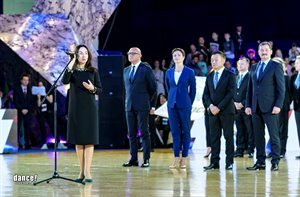 And for the whole event, which was professionally organized by The All Russian Federation of DanceSport and Acrobatic Rock’n’Roll. 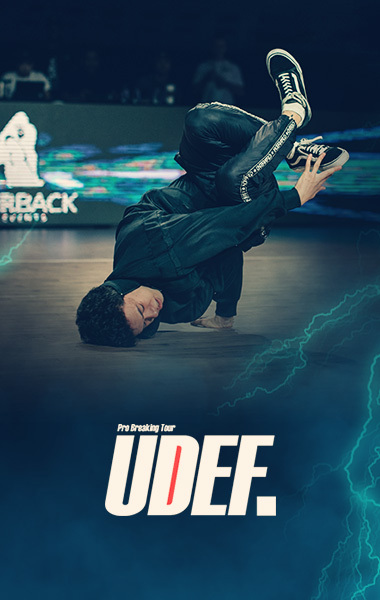 They have raised the standard of such a dance sport festival to a new level and we were privileged and fortunate to be there to learn and to appreciate the different aspects of a top quality event as we are approaching a new decade. The top 12 of the Grand Slam ranking list will receive an invitation to Shanghai, to the Grand Slam Series Final. 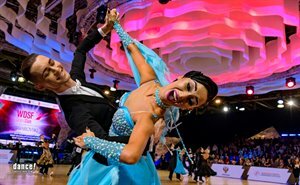 With their fifth place at ROC Vaidotas Lacitis and Veronika Golodneva from Lithuania climbed up the ranking list and secured their place among those who will walk the red carpet on the first weekend of December. But we will surely see many of these couples attending the World Championship in Vienna in a few weeks. We are all looking forward to it, too. 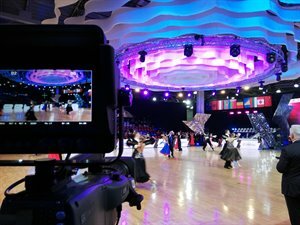 You can relive the decisive stages of the Grand Slam Series at Russian Open Dancesport Championships 2018 at www.flodance.com. It WAS worth waiting for. You could feel the excitement as the final was getting closer and closer. The chants from the crowd filled the air when these six talented couples entered the dance floor and let us all feel and experience the true beauty of Standard dancing. The crowd showed their support to all couples and especially to their own favourites. Unfortunately we will have to be patient as we are some 30 minutes behind schedule at the moment. But as they say, all good is worth waiting for, and we are really looking forward to the exciting GrandSlam Standard final! There are three Russians, two Lithuanians and one German couple in the final. The live band is playing, the crowd is cheering and the quarterfinal is over. We have the list of semifinalists. 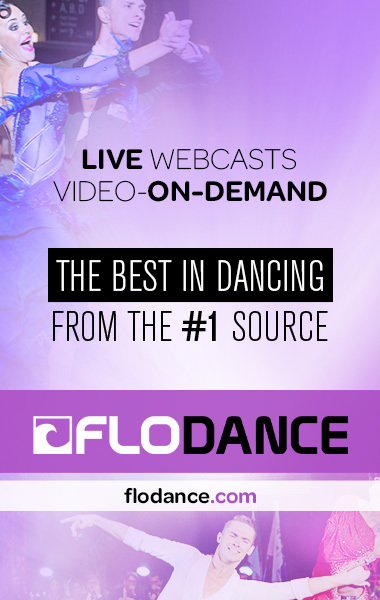 You can join the live action via Flodance.com. There have already been two rounds of Grand Slam Standard in Moscow today and 49 best couples have qualified for 1/8 final which is about to start right this minute. We hope you have had a chance to see the free live stream by the Russian Open organisers on their YouTube channel. 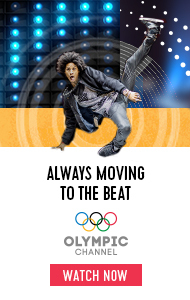 At quarterfinal we will continue with our partner Flodance.com. According to the schedule that should be happening at 16:33 CET, semifinal at 18:31 CET and final at 19:46 CET. The hall was covered with lights, music was played with a live orchestra and the dancers were enjoying the supportive atmosphere. The tribunes were full and every corner where one could see his favourite couple was packed with people standing and trying to find a good view to the floor. TV cameras captured all the best moments from different angles and it was obvious to everyone that something big was happening towards the end of the day. 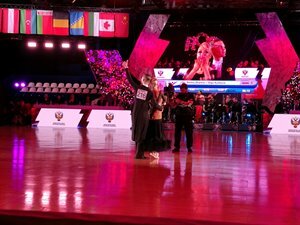 We were fortunate to have the IOC Executive Board Member Mr. Ivo Ferriani there to witness dance sport at its best. And that it sure was! It was a tight competition, starting at the difference of 0,084 points which resolved the last spot for Canadians Winson Tam and Anastasia Novikova at semi-finals. Crowd was cheering very loudly to their favourites, and the dancers brought some electricity to the dance floor, heat after heat, dance after dance. When the six finalists were announced everyone was just waiting for the spectacular final to start. It was their chance to see the World Champions, Armen Tsaturyan and Svetlana Gudyno, at their home ground. Another Russian couple, Andrey Gusev and Vera Bondareva, were there too, as well as Timur Imametdinov and Nina Bezzubova from Germany, Charles-Guillaume Schmitt and Elena Salikhova from France, Andrea Silvestri and Martina Varadi from Hungary, and Edgar Marcos Borjas and Alina Nowak from Poland. They all did well, their total scores in the final round were better for all of them than previously in semi final round. The tightest battle was for the second place, which was finally announced for Timur and Nina over Andrey and Vera for 0,418 points. The winners, however, secured their position with 5,25 points. And to the delight for the home crowd the winners were Armen and Svetlana, who continued their winning streak in a superb way. Before the Dance of Honour Armen and Svetlana addressed the crowd in Russian saying that dancing on their home ground gives a special twist, dancing went well, but also that being the leader of the pack means responsibility to succeed. As they mentioned during a short interview after the result, it is different to be climbing up the stairs than to hold on the position on the highest step. With huge smiles on their faces, the chosen Dance of Honour was rumba. What a beautiful closure to an emotional and high quality day of Latin dancing. 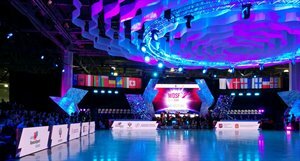 The road to Shanghai, to the WDSF Grand Slam Series Final 2018 has now come to an end and the top 12 couples on the Grand Slam ranking list will receive an invitation to participate the anticipated climax in the beginning of December. More photos and videos will be uploaded here. 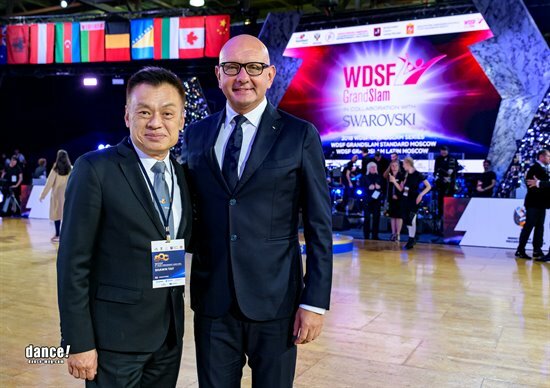 The All Russian Federation of DanceSport and Acrobatic Rock’n’Roll (FDSARR) had an honour to welcome the IOC Executive Board Member, Mr. Ivo Ferriani, to join the Russian Open Dancesport Championships 2018 and see the decisive stages of Grand Slam Latin live. He was accompanied with Ms Nadezhda Erastova, the President of FDSARR, and Mr. Shawn Tay, the WDSF Chief Executive Officer. 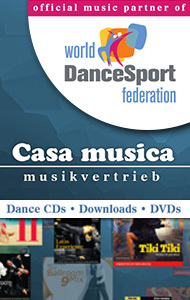 They discussed the future of dance sport at the same time as the Latin discipline showed its best. According to his feedback given at the venue, Mr. Ferriani was very delighted of the atmosphere, the setting and the high quality of the Latin competition. 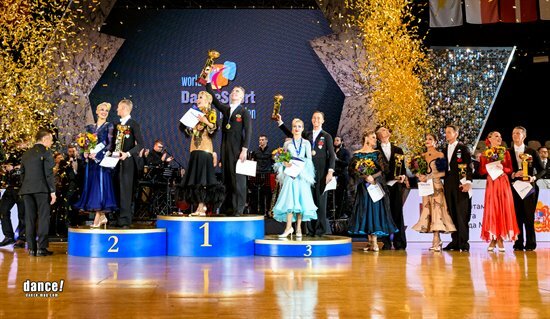 Thank you for visiting, we were all honoured to have Mr. Ferriani joining the WDSF Grand Slam Latin 2018 in Moscow! And today: the Grand Slam Standard in Moscow!